I was especially touched by this, though, her gift of Kiki’s picture from a neighbor special in her town, because of Kiki’s resemblance to Luna the cat from Sailor Moon, the sort of town mascot. Thank you very much Lenore! Just some more pictures of us around town! Some of you might remember that her town is themed around the four seasons, with each section in town and each character representing a season. Lenore’s spring castle garden is coming along beautifully! It reminds me a lot of Estel’s, though of course, fittingly looks a lot better in the springtime than Estel’s does. Estel’s looks best in winter, I think. Something that’s extremely brilliant is the incorporation of some of Lenore’s dream neighbors into her town’s seasonal theme, like Bud here, who obviously has a very summery house! 😮 It’s such a cool room, too, with the shark and everything! I’d love to hang out in here. Got to see some new changes and additions around her town, like this lighthouse! And I got to see one of my favorite spots in her town again, the well-placed streetlamps by the bridge, surrounded by cherry trees 😀 Thank you for your help with my wishlist, Lenore, and for Kiki’s pic and having me over to your town, it’s coming along great! I got to WiFi with Megan again recently in New Leaf after WiFing with her in Wild World a few times! It will go in my little tulip field here ^^ Later on she also gave me a gemini closet and box of tissues, thanks for those as well Megan! Saying hi to my old neighbor Vesta, who I think is one of her favorites! It’s funny, Vesta was one of the first neighbors in both Dafdilly and Citàlune, but I let her move out quite quickly both times 😳 I don’t have anything against her though, it just happened that way! Ordering some of the house parts at Nook’s Homes — strangely a lot of pink ones that day! By the time it was time to go, the sun had set into a deep orange sky — glad you got to see that, Megan! 🙂 Thanks again for everything you gave me and for coming over! This was veryyy exciting! 😀 I got to WiFi with an old friend, Choco, for the first time in a long time! Her first AC:NL town was Belltune, but that town and 3DS was lost, and once she got a new 3DS and AC:NL again, she ended up in the neighboring village of Delltune! Usagi and I poking fun at the other two’s lack of emotion options after some emotion spam. Choco tried morphing us all when we exited the tent, like old times in Wild World, aww…we used to do this all the time! Liam taught us how to go on the train tracks: by sneaking up extremely slowly across the fence while holding a net! I’d seen pictures of people in seemingly impossible-to-get-to places on tumblr, but didn’t know how and didn’t think I’d ever end up doing it myself, awesome I admit it was frustrating to get right at first, but we all got across in the end! We took pictures of the four of us on the bridge before it was time to leave — it was very late her time! Sorry for keeping you up, Choco, but wow, it was so great to WiFi with you and everyone else there again for the first time in a while! 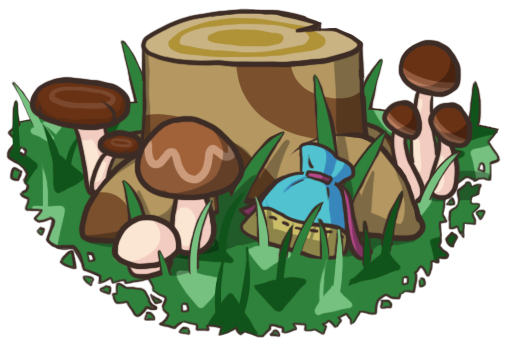 😀 I hope you have a great time building up your new town and playing in Delltune! 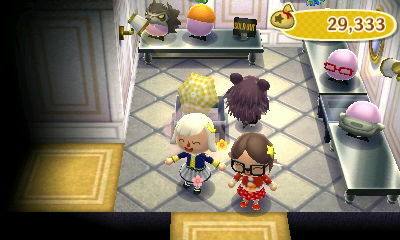 Choco also picked up the Citàlune dress pattern by Marina, she really liked it! I love it too and wish I could wear it, but I have no pattern slots open at the moment, I feel bad about it. 😦 But it’ll always be available at my Ables’ shop if a pattern slot is freed up later. Learning some magic, I guess? 😛 This is the supposed ‘magician’s workroom’ that I need to make more obviously magical. Posted on June 1, 2014 by Amy •	This entry was posted in AC:NL, AC:NL WiFi and tagged Animal Crossing. Bookmark the permalink. Nice post! Everyone looks like they’re having fun 😆 It was fun WiFiing with you, even if I had to make it quick 😛 Maybe in the summer I’ll have more free time so we can do that again? Thanks, hehe! 🙂 Yeah, it was nice to see you again ^_^ And thank you again for the ice cream case, I was thinking of using it in Estel’s dining hall! We’ll see if it looks good, and if not, I’m sure I’ll find another use for it…like maybe sending it to Melba! 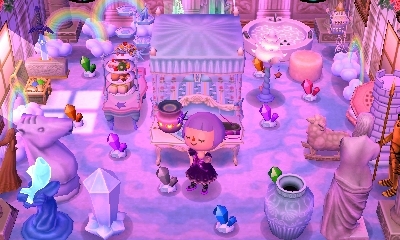 I’d like to restore the interior of her house to a sweets theme, like it was in Wild World. And yes I’d love to WiFi more with you in the future, when you’re more free! 😀 It would be fun to meet up with your fellow blog co-owners as well. You’re welcome and thanks for the afternoon tea set! I’m sure the ice cream case will look great wherever you put it 🙂 As for WiFiing with the other girls from ABOSC, you should probably know that Heather’s Internet hasn’t been working for her 3DS for a while now, so she can’t WiFi 😦 I think you would have to ask Katie about planning a WiFi yourself if you wanted to do that with her! I’ll probably be *really* free in a week or two, myself (plus today)! Oh, that’d be good, too! The only thing is, my town is in the middle of a flower-rearrangement process, so I don’t think I’d be able to host 😦 I hope we can all WiFi soon, though! Yeah, that’d be great 😀 Ah, good luck and have fun with your flower re-arranging! I quite enjoy doing that. Lenore’s town is… ahem, interesting 😛 Haha oh well, even though her town has lots of corresponding points to Citàlune, the seasonal concept is still interesting and original. I wonder how it’ll turn out! And yaaay, Choco is back~ Aww, how nostalgic, seeing the two of you on the regal bed mirrored in that old photo. I didn’t know getting onto the train tracks was that simple! 😮 I always thought it was some complicated hole-digging process. Lol, you’re literally sneaking past the game’s defences. It’s okay! It didn’t take long at all and I really couldn’t resist 😛 Take it with a grain of salt too, because even now some of the borders confuse me like the plaza and the cliffs, which I’ve been proven wrong by before. Thank you very much again, ahh! And that was part of what confused me too, I wasn’t sure how close or far away I should put PWPs from the plaza to repel houses from there, or from bridges or pavement… I guess I shouldn’t have worried about that too much; I’m sure if you spread 30 PWPs around town, it’s bound to make resetting for a house location easier! UGH I am having the worst animal crossing day EVER 😦 Julian just moved out due to a TT accident so I am looking for someone to (hopefully) come rescue him from the void and then hold him for me while I cycle 16 villagers. Do you think maybe you could hold onto Beau for me in your cycle town while I cycle 16 villagers? I’ll tell you when Beau moves out and then if you could hold him that would be awesome! He can be neighbors with Melba for awhile! Oh I also wanted to ask you if you knew anything about having the same villager back in your town. I know you have to go through 16 villagers but do 16 villagers have to move in OR out or does it only count if they move out? Okay, sounds good! 🙂 And I’m sorry, but I’ve never done the 16 villager cycle, so I don’t know for sure from personal experience, and what I know is from hear-say. But from my understanding, I think 16 villagers have to move out (hence the term cycle). Beau has officially moved in successfully! I reset for his house plot to go in a spot that would help me repel houses, making it easier to move in Melba to the spot I want (still in the process of spreading PWPs all over town). Then a villager (Tammy) moved out, freeing up a slot for Melba to move in soon, hopefully 🙂 So it’s all worked out! Sure, just added! 🙂 Hehe I wasn’t sure whether or not to expect an AC blog or not from your URL, but it is, of course! 😀 Always great to find new WordPress AC blogs! Hm…Citàluna… The name reminds me of your town name but I guess it does have some unique parts. 😀 I wanna know how that four seasons theme will turn out! Also, about the meet up. Jemma is available on 15 which is Sunday.. I’m gonna wait for Teru’s reply.. yay! I hope the meet up is successful! Aw.. I don’t want you to be all sleepy on your job! If you think you can do it well then.. okay.. 😦 You need your daily 8 hour sleep! So do you think the 14th works for Jemma and Teru? Is the WiFi on the 14th still on? Or are we doing it on the 15th, or another date? Just curious! But right now (6pm) I am going to have dinner, so I may be late (if it’s happening at all). I’ll check for gates right after I come back. Alright! I’ll be opening my gates.. I got a headache and only just realized there was a meet up.. See you guys! I think we were waiting on you to decide! Lol. Though it seems like we didn’t get a confirmation from Jemma for today? Ohh bummer, I’m soo sorry I missed it! I guess I couldn’t handle getting up at 5 AM today after all 😦 I hope you three had fun, though! 🙂 Ahh sorry again! Ooh cool, I have Bunnie too ^_^ Though she’s one of my newer neighbors. Melba is the neighbor who has lived in town the longest, though she wasn’t an original neighbor and moved in around July, and she’ll be moving out soon 😦 The next longest is Colton! Hi Amy! I know you are most likely busy, but my friend keeps bugging me about how he can’t get any items he wants, so I said I would get some of the items from his wish list for him. Can I offer you the sloppy bed and golden table for the afternoon tea set and hibiscus? Sorry, this is not related to the post. In one of Luna Crossing’s recent posts she mentioned that you taught her how to do that grid thing. If you don’t mind could you show me? When you said you made two patterns, did you mean in the game? Yep! I made two patterns, one red and one blue. All I did was outline the edge of the square grid with red or blue. There should be an example pic in the post, the one where I’m showing off a flea. Okay. 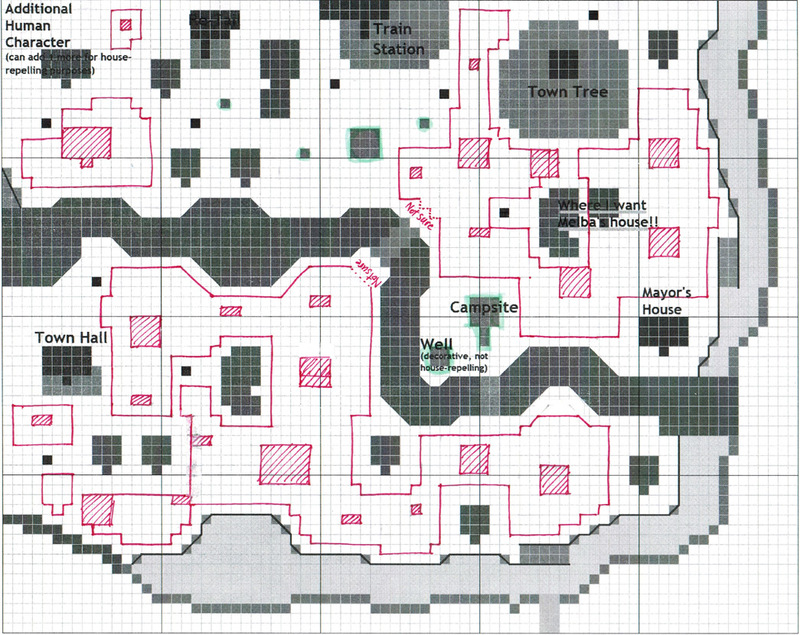 So, where did you get the blank gridded map, and what are the patterns you make in the game for? I made it…I linked to a copy of the grid in that post there. Did you even read the post? 😕 Sorry but the questions you’re asking are explained there! I had read it numerous times… I think I figured it out though. Sorry to bother you with the questions. How/where did you make that grid outline of your town? I’ve been wanting to do that for quite awhile now so it’ll be easier for me to plan everything out and know the cost.